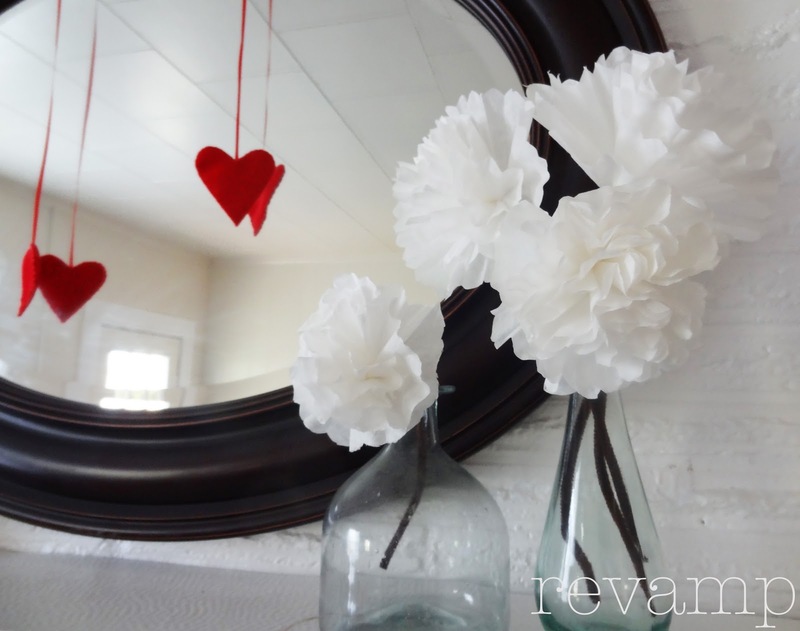 With Valentine's Day a little more than 2 weeks away, love is definitely in the air. 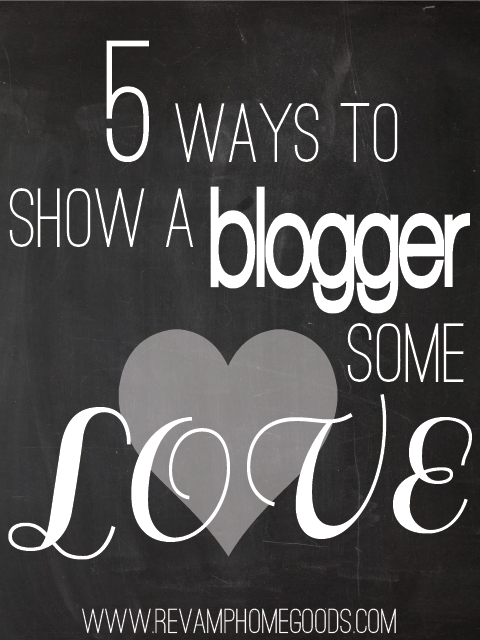 Don't forget to show those around you some love and why not start with your favorite blogger? Yes I'm a blogger so all of the information below hits close to home, but this isn't just about me and my readers. With all the blogs out there (over 6.5 million!) you are either a blogger, know a blogger, or enjoy reading a blog. Are you doing all you can to help that small business succeed? Wait, back up...small business? Yep, that's exactly what a blog is to many bloggers - whether they sell ad space, own an online shop or offer freelance writing or other types of services (or are building their blog towards these) - the blog is their business and each of the five tips below will help to build and grow their business. 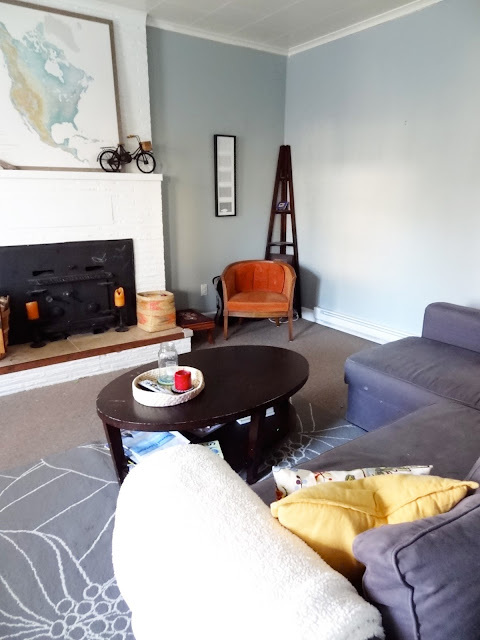 A recent post on my living room update and my latest Houzz Ideabook and the uproar it caused in the design world (I wish!) over the length of my curtains got me thinking....Why do we think we HAVE to abide by someone else's rules for our home to be considered beautiful or well-designed? And, why are we bullied into doing things because someone else says it looks good or, on the flip side, that it doesn't? Don't get me wrong, this is not a rant against negative feedback but just a nudge to all of us to open up our minds just a little. What What, What, What - I'm not the only one with a thrifting addiction or a fondness for fur(ish) coats. I went through a rebellious awesome stage in high school where I wore the most god awful clothes I could find - my number one outfit for away basketball games was a bright floral muumuu and a pink fur coat - Mimi would have been jealous. Eat your heart out, Macklemore. Setting trends and breaking hearts. I love me some big chunky stripes. Ever since I painted Luke's room with large horizontal stripes I've had an addiction with the crisp and bold design trend. I even ended up painting a rug which lives under our bed. Like "The Bruce Dickinson" and his cowbell, I just can't curb my desire for more stripes. 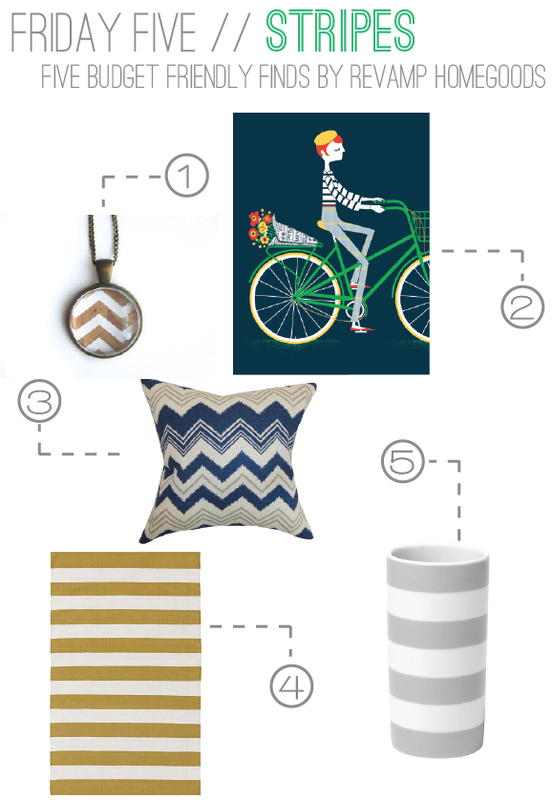 So the first of many Friday Five posts, which is where I showcase five budget-friendly items based on a weekly theme, is dedicated to one of my most favorite of things...at the moment....STRIPES! Each of these are sure to make a big impact - whether it is in your home or on your person - and a little dent in your wallet. So are you guys still loving the striped trend with me? Can you really call stripes a trend? For some reason I really like thinking of fun little traditions our family can take part in, (like Christmas in July! ), but the executing of these said traditions is a whole 'nother story. On Fridays I suggested we take part in Family Game Night - problem is...I kind of, sort of, don't really like playing games. It's not the games, it's me. I'm just so tired of winning - I'd rather cuddle up on the couch, scarf popcorn and watch movies. The other two men in my family love games, so I'm sure a compromise is in order. Then I created a date night jar and a bucket list, both of which have only been used once. While many traditions in this household have been abandoned along the way there's one tradition in our household that we've kept around. I hinted at these yearbooks when I was organizing the tv cabinet. Each year I make a Padgett Family Yearbook which highlights the past year's travel and activities in photos. We have 8 books and counting (fingers crossed.) The first one starts during our dating adventures, which began in 2005, then fast-forwards through 2006 because this girl went a little crazy and suffered from a bout of commitment-phobia. But don't fret, things resumed in 2007 and have been going strong ever since with couple extra additions that have made their way into our stack - like our wedding album and one dedicated to our little man. I teased you guys earlier this week when I shared my new living room curtains with you. Well, as promised, here's the tutorial for all of you who want to make your own or are just curious how it was done. By no means am I a skilled seamstress....more of a fly by the seat of my pants and hope things work out type. Luckily I have my Nana to help me wrap my head around projects. 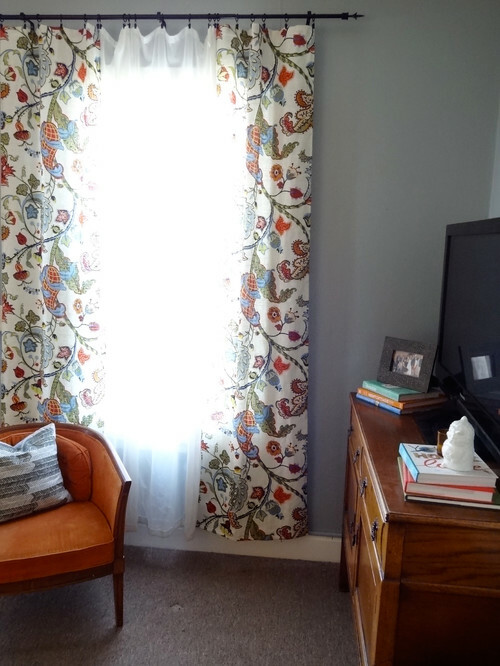 Skills or not, these curtains are sooo easy to make. And for all of those "I like the curtains better longer" folks: Yes, I know that these are rocking the high-water style, but I'd rather have a set of curtains than a pile of threads. For some reason our cat won't mess with them at this length, but when they are to the floor they get destroyed. For all the tips and tricks for making your own, check out the full tutorial on my latest Houzz Ideabook. 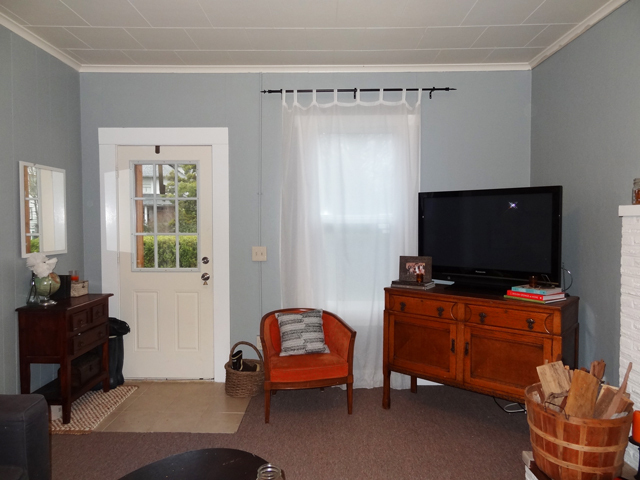 I'm still in awe how much these curtains transformed our living room. It feels like a different space altogether and all it took me was an hour's time, tops! So what do you use to transform a space? Paint, textiles or both? Continuing on my quest for a more organized and all-around more relaxing home, I hit the living room for the second time. With the eastern side of the room cleaned up it was time to hit the western half. Since I had already picked up the toys and books, plus cleaned up the sofa - this side of the room was pretty well organized. What it was lacking was any sense of style or personality - just like the east side of the room before the addition of the vibrant draperies which are intentionally rocking a high-water style and the throw pillows. Since I moved the large map from the large wall to the mantle (which seems to work better) the wall is back to being a large blank wall. I didn't tackle that bare space, but I did work on the wall to the right of the fireplace. 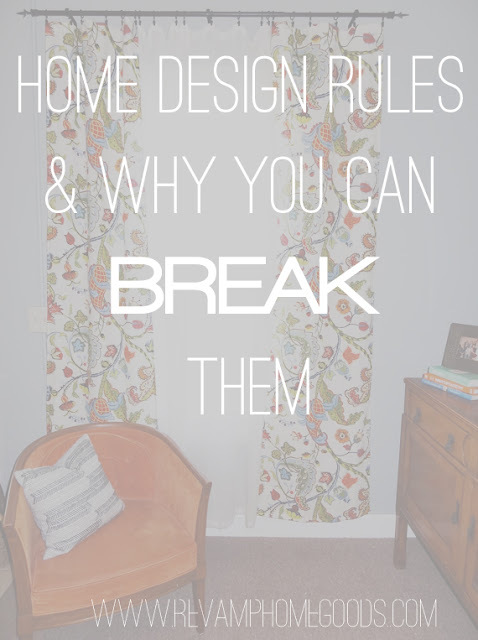 Creating a room that feels put together and cohesive is every homeowner's dream. Paint, drapery and decor are each important to the overall design and feeling in a space. Throw pillows - a great accessory to achieving this well-rounded look - can add a burst of color, texture and personality and are a great way to play with patterns and colors. Beautifully covered pillows are easy on the eyes, but perhaps not so much on your pocketbook. Using leftover Covington Wilmington Multi fabric from my drapery panels, I made two envelope-style throw pillows. 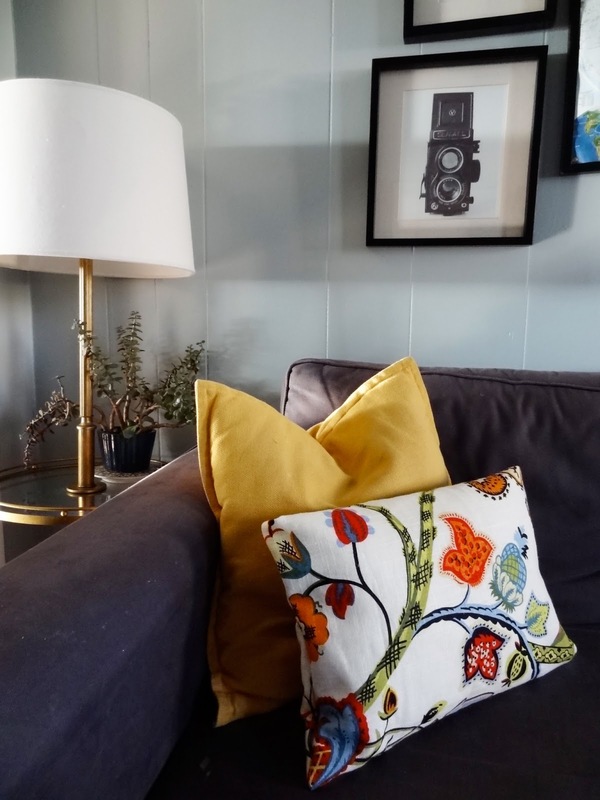 These envelope-style pillow covers are the perfect use of leftover fabric giving my simple navy sofa a boost of color and pattern. They can easily be removed for cleaning or just to change-up the decor. Four yards of fabric arrived at our doorstep a week or so later. I was so excited to get started on the roman shades so I ripped open the package and pulled out the fabric. In the five seconds that it took to take it in I knew that it would be perfect for the living room. Yes, that's right. The living room. So, I guess it's back to the grind on finding fabric for the kitchen, but at least I found the perfect fabric for one room in our house. The full DIY on how I made these simple sag-top drapery panels is on its way via Houzz, but I couldn't help but share a few photos with all of you....and if you're following me on Instagram, you probably already saw the sneak peek. Here's what the room looked like after it got an organization overhaul. Pretty organized, but definitely lacking in personality. And here's what it looks like with a pair of beautiful sag-top drapes flanking the window. I'm not digging the art behind the couch. I think it's the map. 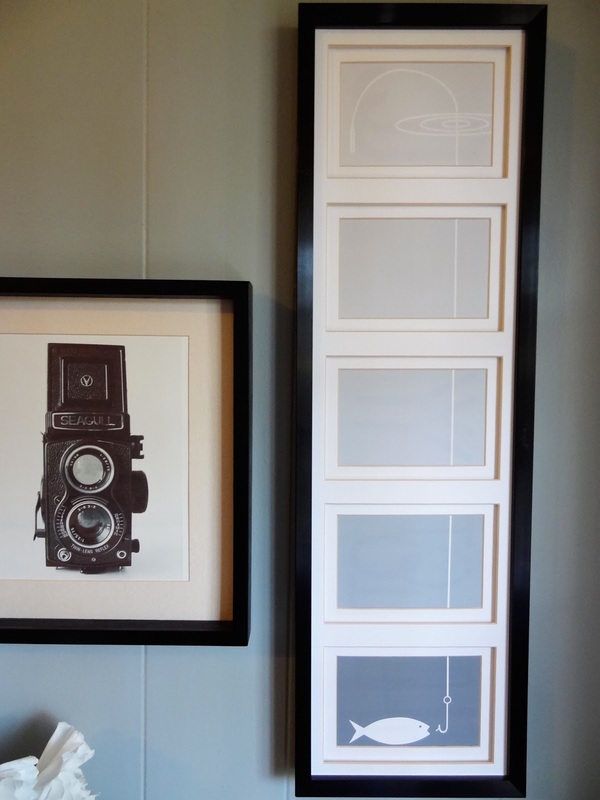 I have a plan for something new so the frames that were hanging are now up for grabs. I have this long 5 photo frame that we had family photos in and then it housed some typography art for the holidays. I took it down a few days ago and set it across the room. There it sat - taunting me. Daring me to make something to put into it. And so I did. You ever have those moments where an idea just hits you and you're like...Hells Yes!? This was one of those times. This project gets filed under ABOUT TIME! I've been wanting to revamp our entry mirror with driftwood since it was hung. After seeing this and this I was even more motivated. 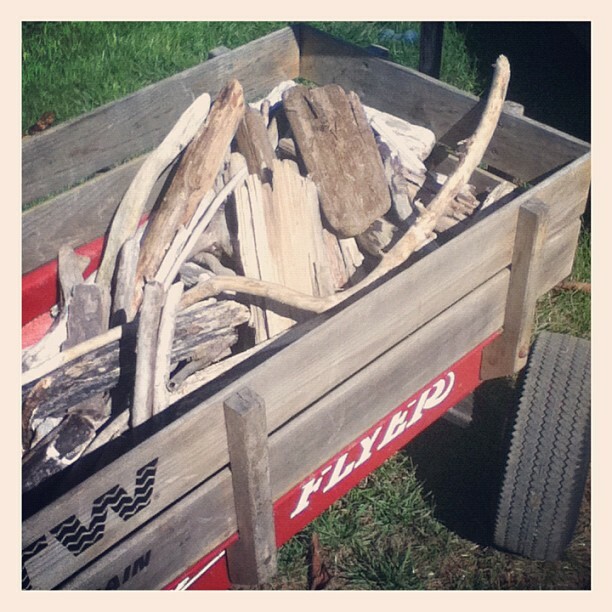 So motivated even, that back in August I went on a successful hunt for driftwood and brought back a large assortment of all different sizes and shapes. With a few pieces glued down I started to have second thoughts about the adhesive I was using (slow drying time and pretty stinky) which was leftover from my Driftwood Chalkboard project. Then unmotivation set in. (A word? Probably not.) I removed the few pieces of driftwood that I had glued, hung the mirror back up and all of a sudden sunny August turned into dreary January. 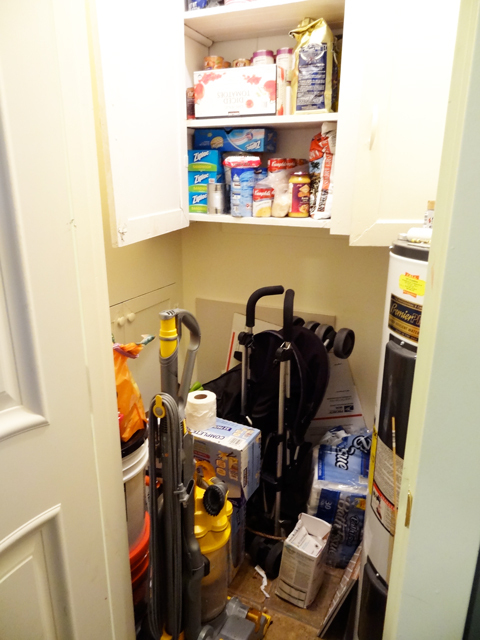 Last week our house-wide organization extravaganza began with the kitchen cabinet and moved on to the bathroom cabinet and hallway closet. If you think that's all our little house needed to get in tip top shape then you be crazy! Our house is out of control and there's not one room - let alone one corner - that doesn't need some attention, so I'm hitting one place at a time and moving throughout the entire house. My next battle was against the side of the living room nearest the entry door, which is visitors' first impression. The trouble spots is a chair and two cabinets - our tv stand and our entry cabinet. Unorganized is a understatement. The tv cabinet holds our dvds, cable box and blu-ray and the drawers are a mix of junk that we just shove in there because we don't want to take the time to find a more appropriate place for it. This guy is the main offender. Really, ever since we moved from Seattle in 2010 we haven't utilized it - we stuck a bunch of random things in there to move and that's where they stayed. It's full of useless papers, things we don't use and don't plan on using and god knows what else. I worked through the cabinet one drawer at a time. I used a trash bin, a bag for donations, a bag for things to keep that needed to find new homes and our home filing box to organize through the clutter. I was amazed and a little embarrassed at the random junk we were hanging on to. Carrying on the organization trend and in keeping with Apartment Therapy's January Cure Day 5, I tackled another project off THE LIST - another black hole in our home that had been far too long overlooked. 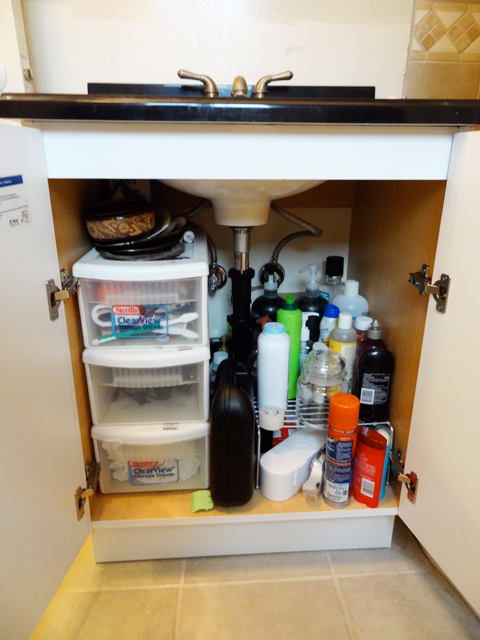 The bathroom cabinet, like the cabinet under our kitchen sink, was in desperate need of some organization. Just like in the kitchen we were using a rack to utilize some multi-level storage and just like in the kitchen it was failing. Every time we opened the door something would fall out. Sounds familiar, right? I took everything out except the stackable drawers. I went through everything - even the drawers - and purged a bunch of things that were either outdated, unused or not in the right place. I found a new home on the cabinet door for my hair tools using a removable Command hook which opened up a whole drawer for toiletry items. 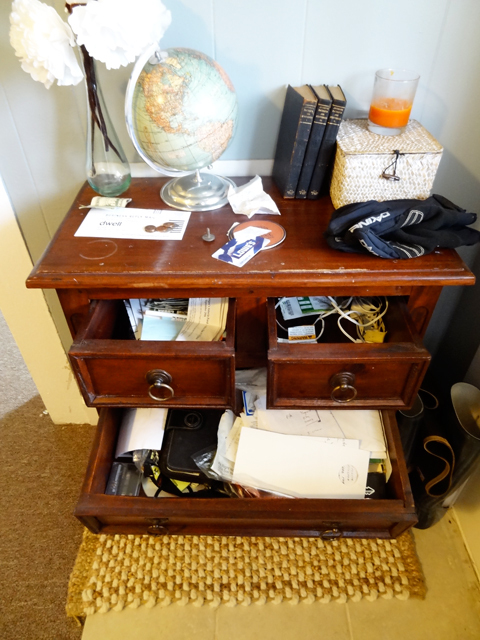 The drawers could still use some organization inside - perhaps some small bins to corral items - but for now it'll do. I'm a little behind over here and completely missed the first few days of Apartment Therapy's January Cure. It was probably my lazy side that was quite comfortable snuggled up on the couch so it took drastic measures and locked my motivated side up far away from Apartment Therapy feeds. Luckily for my home's well-being - and my husband's sanity - my motivated side broke out of captivity because things were starting to get pretty chaotic up in her'. 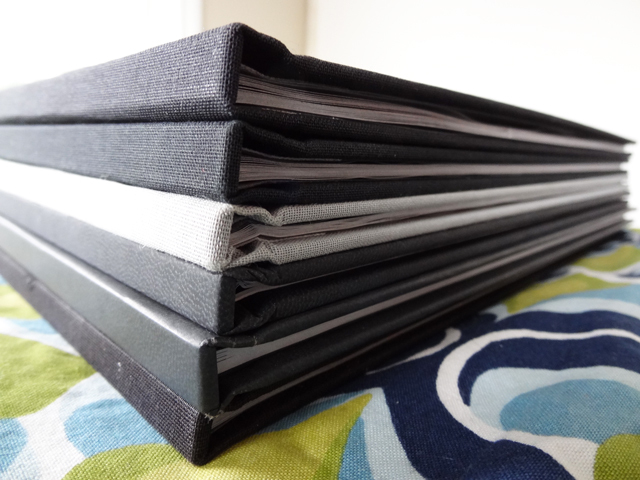 The first assignment of the 31-day challenge was to create a Project List - going from room to room and writing down everything that needed attention. Simple enough. Writing lists is my forte - keeping track of that list and not losing it amongst the clutter is a whole 'nother story. So in an effort to keep myself accountable I'm sharing the entire list here with you. It just so happens that 2/3rd of our family came down with a nasty cold. Luke and I have been cuddled up in bed together all day munching on goldfish and watching Lady & the Tramp and Downton Abbey. After the third time watching the beaver take off Lady's muzzle (hmm...that doesn't sound quite right), I decided to break out the pad and pen and get to writing my Project List - starting with the bedroom of course. Has your home gotten a bit out of control, like mine? Between all of the home projects we've been tackling lately our house has become somewhat of a hoarder's paradise. Not quite the rat infested garbage heap that TLC likes to sensationalize, but pretty.dang.close. It's just that there's so much to do and I just don't wanna do it! (Picture me crossing my arms, furrowing my eyebrows and stomping my foot.) You guys feel me? Even though my choice would be to ignore the chaos for a little bit longer - I just can't. So, rather than waiting until the first sign of spring for the proverbial spring cleaning - I'm getting started now. We went hogwild this weekend and finally tackled a few areas that have been quite frustrating. 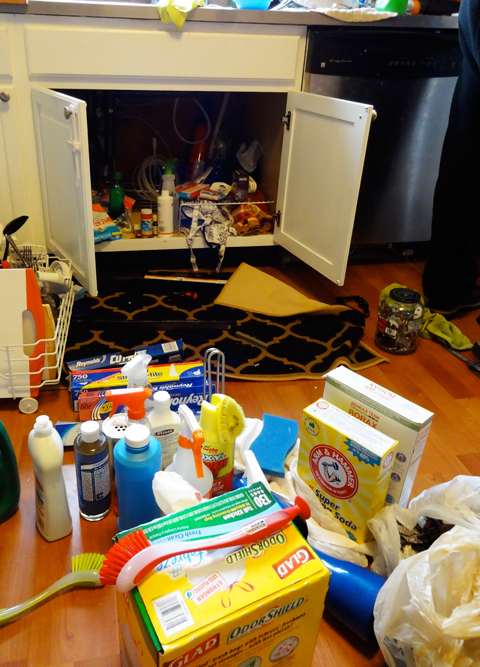 It all started when I walked into the kitchen and found the under-the-sink cabinet's contents on the kitchen floor. Apparently, Josh thought it was a good time to try and fix our busted dishwasher. That man certainly knows the way to my heart - for those of you that don't know, hand-washing dishes is my kryptonite. So a little mess in an attempt to make me happy was alright with me. With the cabinet already halfway emptied, I thought it was a good time to finally tackle this organization issue. I failed to snap a "Before" photo, but this does a good job showing the ridiculous amount of things that were shoved in there - vases, bubbles, cleaning supplies, jars of screws. I'm surprised a clown car didn't find it's way out of there. Saturday, 7 am. While every good wife would be in the kitchen fixin' her loving family a breakfast fit for royalty (or in our case, a bunch of lumberjacks), I'm sitting here glued to my laptop. While catching up on some good ol' blog reading, I came across a post by Nate B. about his Vintage Gift Guide picks from V&M. Curiosity led me on over to V&M which I hadn't heard of before. With that one click, the clouds parted, the rains ceased and, unfortunately for my husband, I found my new online obsession. Vintage & Modern is the leading online source for unique vintage furniture, antiques, art, jewelry, fashion and design from around the world. WHAT?! Vintage shopping from the comfort of your couch? I.AM.THERE. How have I NOT heard about V&M before?! Or have I? I'm not completely convinced that this is actually my first visit - I think I stumbled upon it back in the day. Why it didn't resonate back then, I'll never know. But, now I'm hooked. 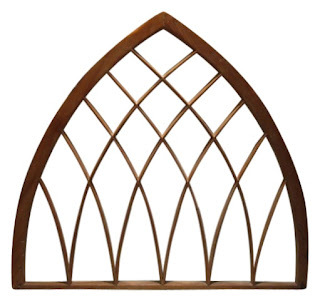 Not only does V&M have a drool-worthy collection of furniture & accessories - like this gorgeous antique gothic arch top window below. It also has TV. So, if I'm not annoying my husband enough by spending hours browsing the shops I can skip on over to the READ section (which also includes TV) and really check out. And just when he's about to match me with some fantasy football "research" I'll just show him the Breweriana section and that's how I'll bring him over to the dark side. So what about you guys? Have any favorite online shopping destinations that fuel your home design obsession? Channeling Ms. Martha Stewart, I get a big urge to organize with the passing of the holidays or the changing of the seasons - whether it's one room, the whole house or this little ol' blog. Earlier this week I packed up all the Christmas decorations, but as I mentioned before, there really wasn't much to pack up. There's definitely some organization needed throughout the rest of the house, but that would require me to go to our freezing cold unfinished upstairs. Not gonna happen. 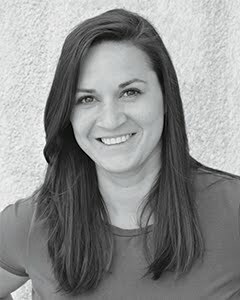 So with the house out of the question for now and with a little motivation from Katie over at Bower Power, I decided to organize the blog. I used to have a "Tutorials" page that was just a running list of the project name and a link. Pretty plain, pretty uninspiring. If I were looking at any other blog I probably would skip right past it. Taking from my "get 'er done" resolution, I finally put in some work and updated my project page. The "Tutorials" page has now been completely replaced by the "Project Gallery" page. The Project Gallery is a much more attractive reference for my projects. Rather than a running list of text, it's now a nice gallery of project snapshots that are hyperlinked to each respective blog post. Not only is it more visibly appealing, but it also shows new readers my style and what this little blog is about, which is pretty much a little of everything...just like my eclectic style. Setting resolutions, a yearly ritual where we reflect on how awful we are and resolve to be better, may not be for everyone. But I, for one, love making a list whether it be shopping or a little self-help. The list part I've got down, but the sticking to it is a whole 'nother story. I don't know how many times I've made a resolution just to forget about it come February 1st. "Oh, did I say I was going to be a nicer person...Oops. Guess it just slipped my mind. I guess I'll just have to try again come January 1st, 2014." This year my resolutions are pretty standard; stop being so damn lazy, get organized, have more fun and make quality time with the family. Really they're all subjective so I'm pretty sure that come December 31st I'll be feeling pretty successful. Oh and did I mention my "get 'er done" subsection of my "stop being so damn lazy" resolution? 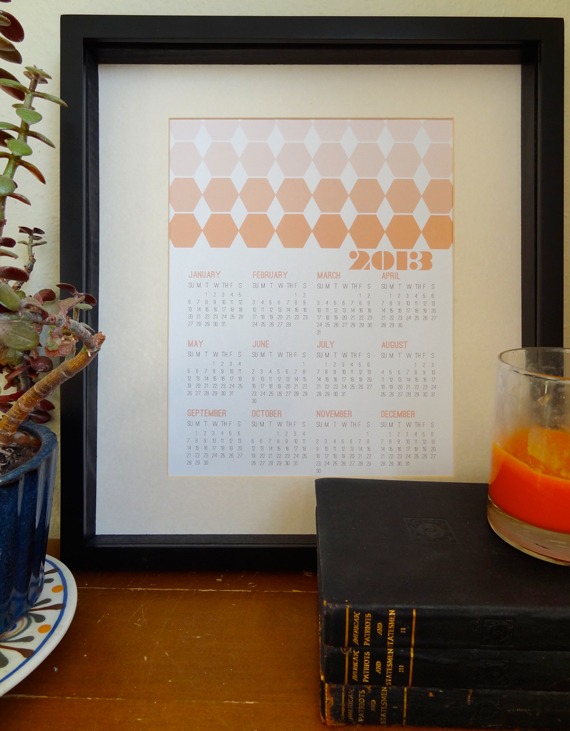 With these new 2013 Geometric Calendars that just made their way on to my Etsy shop, I'm well on my way to checking that off the list, plus the "get organized" one too. So what about you guys? Have any unique resolutions you'd like to share?